OPTITOOL analyzes cutting conditions, dramatically reduces "air cutting," optimizes feed rates, and allows users to create better cutting strategies. The sum benefits are a reduction in the production cycle times, enhancement of cutting operations, and fast development of new G-code files for future applications. This NCSIMUL Machine module allows you to optimize the tool lengths, air cutting and cutting conditions of your NC programs (from 3 to 5 continuous axis). Why doesn't OPTITOOL change Tool Path? Optimization should be done in safe NC codes after verification. If the system changes Tool Path, NC codes becomes uncertain (it's possible to have collisions or some problem during machining due to changing Tool path) and to make sure it's safe, we need to verify it again. OPTITOOL doesn't change the tool path, therefore there is no risk. 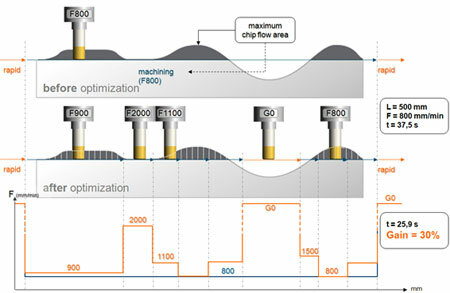 OPTITOOL analyses cutting conditions for each tool path without changing its 3D representation. OPTITOOL features a multi-criteria search function which allows users to analyse one or multiple CNC programs for one or several tools, in accordance with their cutting parameters. Based on the real cutting conditions, OPTITOOL is able to find any tool trajectory sections that require being optimized (air-cutting, feed rate, etc.) and automatically modifies the needed blocks / sections to ensure the fastest machining time-cycle.